Please note – hair care for both brands is virtually the same. 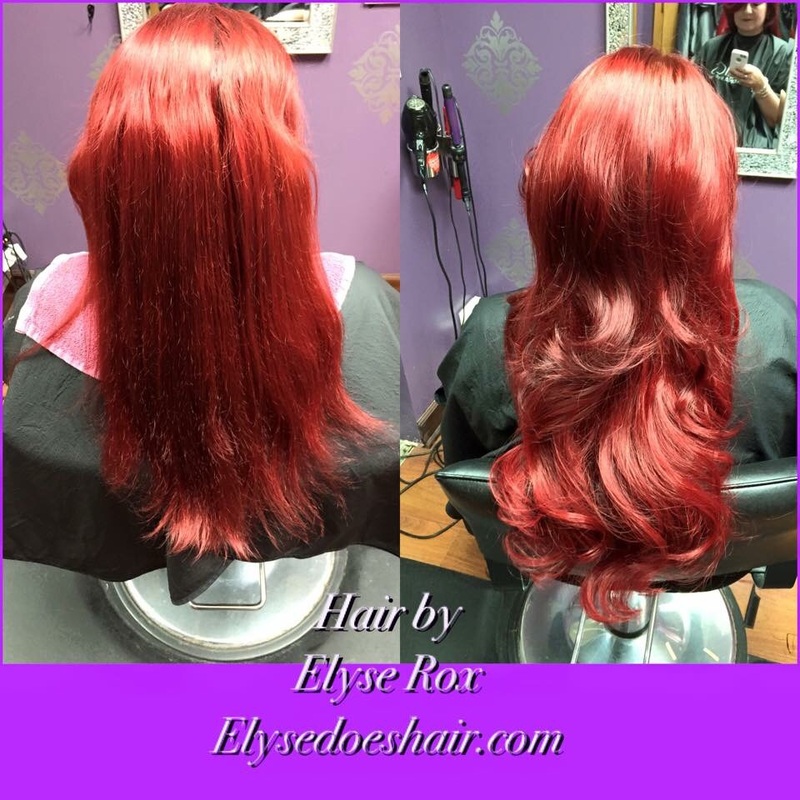 Quick plug – If you are in the Northwest Chicago/Suburban area, my friend Elyse did my extensions both times. She’s an amazing stylist and I would recommend her to anyone wanting awesome, funky, edgy, beautiful, and healthy hair. Here is her website. In the picture above, I am wearing Hotheads Extensions. Stylability – I found these extensions held a curl a lot longer and curled better. My curls were much tighter and would last 3 days with minimal fuss in the mornings. 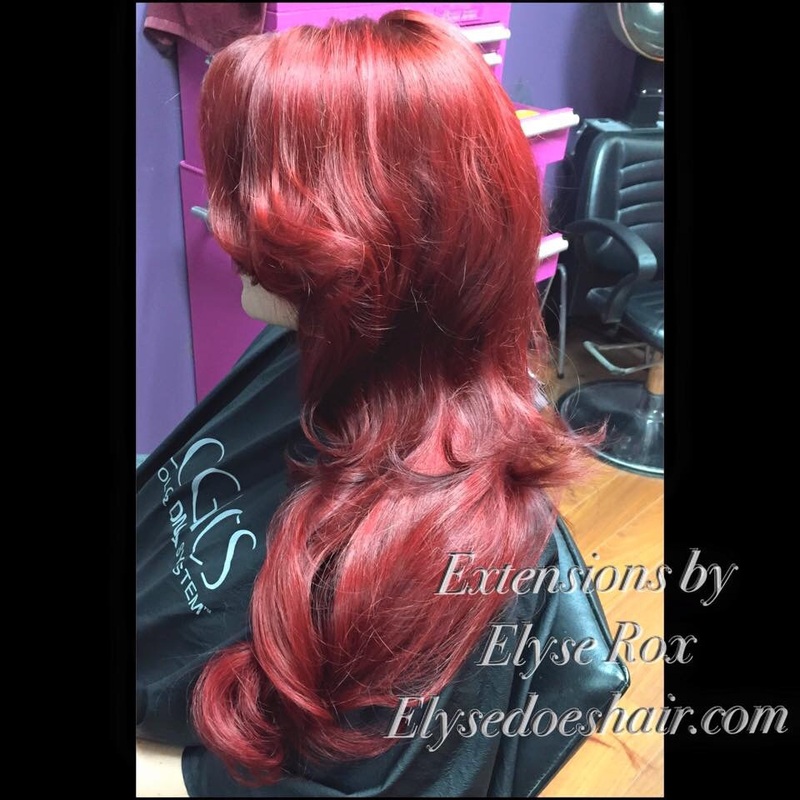 Color deposit on the hair – Even though we color matched and dyed the extension to match my hair color, the extensions had a slightly pinkier shade than my own hair. Shedding – Wow, these things shed SO MUCH. I clogged so many drains, Drano loved me. There was long red hair all over the house, it was rather annoying. Also, with so much shedding, the thickness of my hair was visibly affected. After about 3 months, my hair looked much thinner. Knot creation on hair at tapes – this goes along with the shedding, the hair tangles around itself, causing knots. Knots all the time. Hair appearance start to finish – When it was time to replace this hair, you could really tell. The bottom of my hair was really scraggly. It looked DONE. Would I get this brand again? Maybe, especially if they fixed the shedding problem. I’m saying this because I happen to like the hair texture since it matched my hair. If you are pretty smooth hair, you would be screaming in frustration with these. I hope I preemptively answered any questions you lovelies may have. If you are looking for a review on the extension experience itself, click here. For my birthday this year, I treated myself to hair extensions! It’s a huge investment, but I always felt like my hair was thin and wanted to feel better about myself. My friend is a hair dresser, so she is the one who worked on me. We added some length and we added some volume. And bam! I had mermaid hair. Okay, so what are these? These are Hotheads brand hair extensions. Check them out Hotheads. They are 100% human hair. They come in different colors and if you have a funky color job like me, you will have to dye them to match. Expect to pay about $300 just for the hair alone. The cost of chemical process and application will be extra and will vary based on the salon. UM YES. I love having extensions. They take a little bit getting used to since they pull on the hair a bit, but after a few days you won’t notice. They also itch at the hairline from time to time. Expect some natural shedding from these. So although your hair is super thick during the first few weeks, it will thin out as the extensions lose their hair. You can reuse the same hair 3 times, and you get about 10 weeks of wear after each application. So, every 10 weeks the hair is removed and reapplied. You will get about 6 months of wear out of your hair before you need to repurchase. The hair is removed using an alcohol based remover. One huge adjustment to my daily hair care – you cannot use anything containing alcohol on your hair near the extension bonds. They will dissolve and you may be coming into a salon for an emergency application. Hotheads brand shampoo and conditioner was recommended and I do use them. I may try a different brand of hair extensions next time which has less shedding.